There is no criminal law related to abortion, but that doesn't mean it has no legal framework, experts say. A Dartmouth, N.S. lawyer told local newspaper The Coast she was "fired up and frustrated" when she saw an anti-abortion billboard on the city's busy Windmill Road. A billboard reading "Canada has no abortion laws" was placed in Dartmouth as part of a campaign by the B.C.-based anti-abortion group We Need A Law. Their website says they are trying to persuade "politicians to pass laws that protect children before birth," and states that "Canada is the only democracy in the world which provides no legal protection for pre-born humans." "It's a common misconception about Canadian law that we don't have law protecting abortion rights," Jennifer Taylor, a research lawyer with Stewart-McKelvey, told The Coast. "The billboard just fuels that misinformation." Abortion was a criminal offence in Canada until 1969, when new provisions were added that stated doctors could provide abortions to women provided it had been approved by a "therapeutic abortion committee." In 1988, following the efforts of many activists and of abortion providers such as Dr. Henry Morgentaler, the Supreme Court of Canada struck down the country's existing abortion laws. The laws banning abortion were found to be contrary to Section 7 of the Canadian Charter of Rights and Freedoms, which protects "life, liberty and security of the person." In other words, it's true that there's no criminal law banning abortion, in the same way no criminal laws ban other medical procedures. But the Morgentaler decision of 1988 was a legal decision that stated restricting abortion is unconstitutional. Tabitha Ewert, a lawyer for We Need A Law, said the group is surprised by the controversy. "I understand that some might disagree with our stance that we need a law, but our billboards are factual. Canada has no abortion law," she told HuffPost Canada in an email. "As a lawyer myself, I suggest you ask your legal experts what their basis is for saying a section 7 Charter right is engaged here." Taylor explained to StarMetro that the legal situation is complex, but that it's an oversimplification to state that Canada has no law. "This billboard makes something that's actually quite nuanced into something that's simple but also wrong," she told the paper. "You need a broader definition of law to fully explain the legal framework for abortion access in Canada, but the bottom line is there is a case law saying the Charter protects abortion access." "A lot of our law is developed through cases ... and that case is a big part of our foundation for abortion access in Canada," she added. "But now, abortion is just treated like another insured medical service in Canadian provinces, so it's dealt with as a matter of health care through provincial law and provincial funding for medical services." Like other medical procedures, abortion is regulated under each province's health care system. 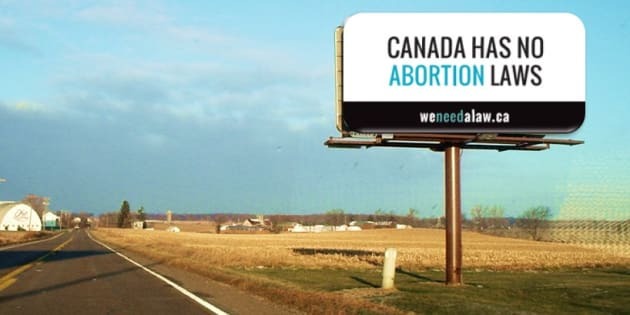 Sarah Baddeley, the Halifax Chair of Women's Legal Education and Action Fund (LEAF), told Global News that the billboards problematically suggest that the procedure is unregulated, as well as further stigmatize women who have abortions. "It's disappointing to see a sign like that come up because it's not true that abortion is unregulated in Canada," she said. "Fear and stigma can be really significant barriers to access for a lot of people as they make a choice that's right for them and a billboard like that fosters that fear and stigma by suggesting that abortion somehow exists in a regulatory void, which is not the case." Joyce Arthur, executive director of the Abortion Rights Coalition of Canada (ARCC), takes issue with that directive. She has been trying to convince Pattison not to run the ads since her organization first got wind of them in June, she says, but hasn't heard back. Anti-abortion advertising such as this billboard contravenes the advertising code that Pattison adheres to, Arthur said. The code "doesn't allow inaccurate ads, and has a very broad definition of that," she told HuffPost Canada. "It doesn't allow ads that are demeaning or discriminatory or degrading to groups of people, including women." She has plans to talk with Pattison next week, she says. "It's just ridiculous that the public has to be subjected to offensive and inaccurate ads until a decision has been reached by Ad Standards." CORRECTION: An earlier version of this story incorrectly referred to Dartmouth, N.S. as Darmouth.